Scientists at Disney Research have developed a plant-based touch interface for their project, the brilliantly named “Botanicus Interacticus”. The project demonstrates how users can control audio and video signals just by touching the foliage in different ways. An electrode is placed in the plant’s soil so that actions such as stroking a leaf or shaking a tree trigger a response on a nearby screen. “Chirp”, a new app that transmits data via a burst of digital birdsong, aims to simplify the way users share images and other files between smartphones. Chirp plays a two-second long noise sounding like a robotic bird which when heard by other devices triggers a download. Chirp can quickly send data to multiple devices at once and could be used to initiate opt-in downloads from poster sites or other OOH displays – birdsong to my ears! JiWire have unveiled a new service to help marketers target specific audiences based on the billions of pieces of location-based data it has collected regarding people’s usage of public wi-fi hotspots. 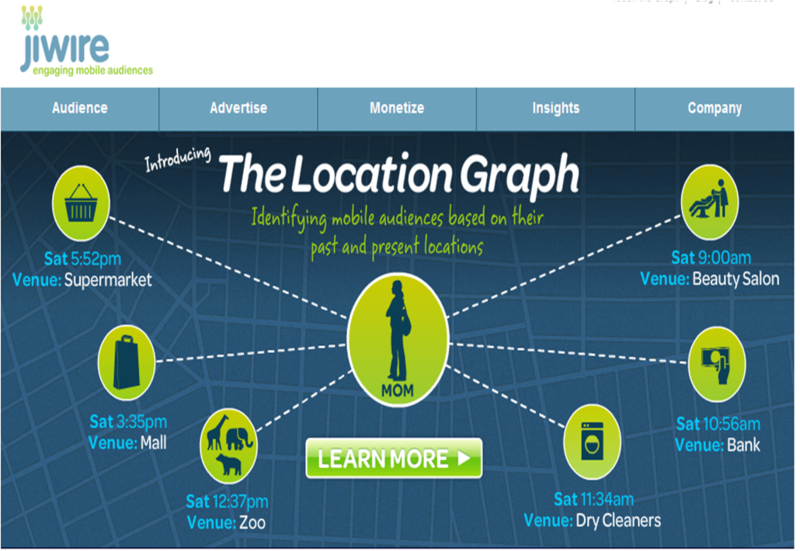 The company’s “Location Graph” harnesses that data to create anonymous user profiles based on the types of places people visit. A new app is being tested in Nashville that can check in people on Facebook and send them offers using facial-recognition cameras. Facedeals uses cameras installed at businesses’ front doors to read visitors’ faces as they enter. If they are users of the app then they will be checked in, and based on their “like” history will receive a customised offer. The Motion Project from Colenso BBDO on behalf of V energy drinks is an amazing visual instrument – a machine that turns motion into music using several Microsoft Kinect depth cameras which allow people to create music by dancing around or waving their hands, etc. Very cool.